Preparing for Thanksgiving dinner can add up to some big bucks. But, with some savvy spending and cooking know-how, the holiday meal can be an inexpensive, memorable feast. Author Diane Morgan's favorite holiday is Thanksgiving. 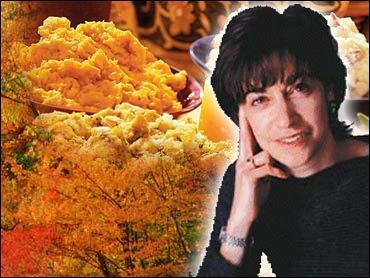 So it's appropriate that her latest book, "The Thanksgiving Table: Recipes and Ideas to Create Your Own Holiday Tradition," focuses on this uniquely American tradition. The Saturday Early Show asked Morgan to take its Chef on a Shoestring Challenge to create a turkey-free Thanksgiving meal for six, with only $60 to spend. Bisque (bihsk): A thick, rich soup usually consisting of pureed seafood, or sometimes fowl or vegetables, and cream. Those oversized, dark, densely textured mushrooms you see sitting alongside the more delicate button mushrooms in the produce department are portobellas. They are delicious sliced and sauteed, or grilled like a burger, and are perfect for a cold weather soup. Portobella mushrooms are rich and meaty which makes this soup aromatic and intensely flavored without the addition of a long list of ingredients. This is a perfect start to a Thanksgiving meal. In a 6- to 8-quart saucepan, melt the butter over medium heat. Swirl to coat the bottom of the pan and saute the leeks and onions, stirring constantly, until slightly softened and well coated with butter, about 2 minutes. Lower the heat, cover the pan, and cook for 30 minutes, stirring occasionally. Add the mushrooms, stir to combine, cover, and cook 10 minutes longer. Raise the heat to medium, stir in the flour and cook 3 minutes. Add the thyme, bay leaf, stock, salt, sugar, and pepper. Simmer, partially covered, for 10 minutes. Cool the soup slightly, discard the bay leaf, and then puree the soup in batches in a blender or food processor fitted with the metal blade. Return the puréed soup to the saucepan and add the cream. Cook over low heat until heated through, but do not let the soup boil. Taste and adjust the seasonings. Ladle the soup into a warmed soup tureen or individual bowls, garnish with the minced parsley, and serve immediately. The soup can be made up to three days ahead. Cool and refrigerate, covered; then re-warm just before serving, and garnish with the parsley. The combination of sautéed pumpkin sprinkled with crisp bits of fried sage leaves, layered and baked between sheets of pasta, and covered with a creamy herb-infused béchamel sauce, makes a splendid Thanksgiving entrée for your vegetarian guests. Once the various components are prepared, assembly is easy and, best of all; the lasagna can be made a day in advance, refrigerated, and then baked fresh for serving. Cut an 8-inch square of cheesecloth, and place the bay leaf, peppercorns, thyme, and parsley in the center. Bring up the ends to form a bag and tie securely with kitchen twine. In a 2½-quart saucepan, combine the milk and bag of spices and heat until hot, but do not let the milk boil. Simmer for 2 minutes; then remove from the heat and allow to steep while preparing the remaining ingredients. Fill an 8- to 10-quart stockpot two-thirds full of water, cover, and bring to a boil over high heat. Add 1 tablespoon of the salt, then add the lasagna noodles, stir, and cook until al dente (cooked through, but still slightly chewy), about 10 minutes. Drain in a colander, rinse with cold water, drain again, and reserve until ready to assemble the lasagna. In a heavy, 8-inch saute pan, heat the oil until it registers 365 degree F on a deep-fat thermometer. It should be hot, but not smoking. Have ready a baking sheet lined with a double-thickness of paper towels. Working quickly, fry one-third of the sage leaves for about 5 seconds; then, using a slotted spoon, transfer to the paper towels. Fry two additional batches. Set the cooking oil aside. Generously sprinkle the sage leaves with kosher salt and reserve. In a 12-inch saute pan, heat 3 tablespoons of the reserved oil over medium-high heat. Without crowding the pan, add slices of squash and sauté until just beginning to brown, about 2 minutes. Turn, and sauté on the other sides; then remove and drain on a baking sheet lined with paper towels. Continue sautéing the squash slices in batches, adding more oil to the pan as needed. Sprinkle the sauteed squash with cayenne and freshly ground pepper to taste. Set aside. In a medium bowl, mix together the ricotta and minced parsley. Set aside. To make the white sauce, in a 3 1/2- to 4-quart heavy saucepan, melt the butter over medium heat. Swirl to coat the pan; then sauté the garlic and onion, stirring constantly, until just beginning to brown, about 2 minutes. Add the flour to the pan, stirring constantly, until the flour is blended and cooked through, 1 minute longer. Remove the spice bag from the milk, and slowly whisk in the milk, about 1 cup at a time. Bring the sauce to a simmer, and cook, whisking constantly, until it has thickened, about 5 minutes. Add the 1 teaspoon of salt and the nutmeg. Stir to blend, and taste and adjust the seasonings. Set aside. Preheat the oven to 350 degrees F. Coat a 9-by-13-inch baking pan with the cooking spray. Lay 3 strips of lasagna noodles lengthwise across the bottom of the prepared dish. Add half of the white sauce, and spread evenly. Place 3 more strips of pasta in the pan. Layer half the squash slices evenly over the noodles. Crumble the fried sage leaves, and sprinkle half evenly over the top. Place three more strips of noodles on top. Use a rubber spatula to spread all the ricotta evenly over the pasta, and then add three more strips of noodles. Layer the remaining squash slices over top and sprinkle with the remaining sage. Add three more strips of pasta, and then spread the remaining white sauce evenly on top. For the final layer, add four strips of noodles and sprinkle evenly with the Parmesan. (The lasagna can be can be made up to 1 day in advance. Refrigerate, covered, and bring to room temperature 1 hour before baking.) Bake until bubbly hot and nicely browned at the edges, about one hour. Let rest for 10 minutes before cutting the lasagna into squares and serving. The recipe directions suggest boiling the lasagna noodles, which is the standard method for making lasagna. However, there are a couple of alternatives worth considering. If a pasta store in your area carries sheets of fresh pasta, substitute six sheets (about 1 1/2 pounds) for the dried lasagna noodles. Lightly rinse off any flour coating the sheets, and use them without precooking. Or buy the oven-ready, no-boil lasagna noodles available in most supermarkets, which are also time-savers. Honestly, they are a terrific product, and it's one less pot to wash. Press the top layer of the no-boil noodles into the white sauce so it gets a bit coated with sauce. Cover the lasagna with foil for the first 30 minutes of baking in order to "steam-cook" this layer; then uncover so it browns nicely. Hazelnuts: Toast with skins on at 375 degrees F for about 15 minutes until lightly browned. When they are cool, lay them on a clean kitchen towel and rub to remove most of the skin (they never completely come off). You can use unsalted cashews if you can't find hazelnuts. Chutney: In a deep 6-quart saucepan, combine the cranberries, sugar, 1 1/4 cups water, cloves, cinnamon sticks, and salt. Bring to a boil over medium heat, stirring frequently to dissolve the sugar. Cook until the cranberries begin to pop open, about 10 to 12 minutes. Adjust the heat so the mixture simmers. Stir in the apples, pears, onion, raisins, and ginger. Continue to cook - stirring frequently until thick - 10 to 15 minutes longer. Remove from the heat, stir in the hazelnuts, and allow the mixture to cool to room temperature. Discard the cinnamon sticks and cloves if you can find them. Refrigerate in tightly sealed jars for up to 3 months. Set a plate lined with double thickness of paper towels next to the stove. Heat the vegetable oil in a six-inch saute pan over medium-high heat until hot but not smoking. Test the temperature of the oil by adding 1 slice of shallot to the hot oil. If the oil begins to bubble and sizzle without splattering, and the shallot turns golden, then the oil is ready. Using a slotted spoon, ad half of the shallots to the oil. Fry until they are crisp and turn a dark golden brown, about one to two minutes. Removed from the oil and drain on paper towels. Repeat with the remaining shallots. Set aside at room temperature until ready to garnish the beans. The shallot crisps can be made server al hours ahead. Heat a 12-inch saute pan over medium-high heat. Add the butter and olive oil, swirl to coat the pan, and then add the green beans. Saute, stirring frequently, until the beans are bright green and crisp-tender, about 5 minutes. Season with salt and pepper to taste. Transfer the beans to a warmed serving bowl and garnish with the shallot crisps. Serve immediately. A free-form tart, whether it's called a galette in French or a crostata in Italian, is a boon to a novice dessert maker. The dough is rolled out, a fruit filling is mounded in the center, and the edges are folded over the filling. There's no fitting the dough into a pie plate and crimping the edges, which can be intimidating to say the least. Though it's not a traditional Thanksgiving dessert, this rustic tart is really a perfect addition. The baked apple slices are tender and caramelized at the edges, the almonds are crunchy and sweet, and the crust is thin and beautifully browned. Toasting nuts brings out their full flavor. Place the nuts in a single layer on a rimmed baking sheet and bake in a preheated 350 degree F oven until lightly browned. It should take about 10 minutes. Transfer the dough to a floured work surface, gathering all the loose bits, and form into a disk about 1 inch thick. Wrap in plastic wrap and refrigerate while you are making the filling. Position a rack in the center of the oven. Preheat the oven to 400ºF. Have a large, un-rimmed baking sheet ready, preferably non-stick. Combine all the ingredients in a large mixing bowl. Mix thoroughly to dissolve the sugar and blend in the spices. Set aside. On a lightly floured work surface, roll out the dough into a circle about 14 inches in diameter. (It is fine for the edges to be uneven; it makes the tart look more rustic.) Dust the work surface and dough with a little more flour, as necessary, to keep the dough from sticking. Roll the dough around the rolling pin, lift it over the baking sheet, and unroll the dough over the pan. Adjust to center the dough; excess dough will hang over the edges of the baking sheet. Mound the filling in the center of the dough, leaving a 2-inch border. Fold the border of the dough over the apples (the center of the tart is open). Pleat the dough and pinch to seal any cracks at the edges. Brush the crust with the milk, and sprinkle generously with sugar. Place the tart in the center of the oven. Bake until the crust is really well browned and the filling bubbly, about 50 to 55 minutes. Transfer the baking sheet to a rack and cool. When ready to serve, slide the tart onto a large platter, and cut into wedges. Sweetened whipped cream or vanilla ice cream makes a wonderful accompaniment.